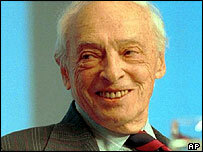 Novelist Saul Bellow, who won the Nobel Prize for Literature in 1976, has died in Massachusetts, aged 89. He was brought up in Chicago, and much of his work deals with that city and the experience of Jews and immigrants in 20th Century America. Bellow's novels included Seize The Day, Henderson The Rain King, Herzog, Mr Sammler's Planet and Humboldt's Gift. His friend Walter Pozen said the writer had been in declining health, but was "wonderfully sharp to the end". Bellow's wife and daughter were at his side when he died at his home in Brookline, Massachusetts, Mr Pozen told the Associated Press news agency. He was born Solomon Bellows near Montreal in 1915, the son of Russian immigrants, who moved to Chicago when he was nine. He learned Hebrew at an early age, and his mother wanted him to be a Talmudic scholar, but he was always attracted to writing. He grew up in the Depression of the 1930s, but said that he found something energising in the determination shown by people around him. "There were people going to libraries and reading books," he said in a 1997 AP interview. "They were going to libraries because they were trying to keep warm; they had no heat in their houses. "There was a great deal of mental energy in those days, of very appealing sorts. Working stiffs were having ideas." His first novel, Dangling Man, was published in 1944, and dealt with a young man's dilemma about whether to sign up for military service in World War II. He made his name with The Adventures of Augie March in 1953, followed by Henderson the Rain King and Herzog. In 1975, Humboldt's Gift won him a Pulitzer prize and paved the way for his Nobel award the following year. Fellow novelist Philip Roth paid tribute to Bellow, saying he was one of two giants of the modern American fiction. "The backbone of 20th Century American literature has been provided by two novelists - William Faulkner and Saul Bellow," Mr Roth said. "Together they are the Melville, Hawthorne, and Twain of the 20th Century." But Bellow himself was more cautious. In his Nobel Prize acceptance speech, Bellow described the modern novel as a "latter-day lean-to, a hovel in which the spirit takes shelter". He added: "It is the best we can do just now." Bellow was married five times, and fathered a daughter at the age of 84. A private funeral is planned, as well as a public memorial. Here are some of your tributes to Nobel Prize-winning author Saul Bellow. Saul Bellow has had a tremendous influence, not only on literature, but on social criticism in general. His chairmanship of the Committee on Social Thought is still remembered fondly here at the University of Chicago. He was truly a giant among thinkers. [I] was first introduced to Bellow at University as part of an American Literature course. Have to say - what a literary giant. I've since gone on to read as much of his work as possible and am always amazed how each novel brings something different to your attention and captures the era in astounding detail. I grew up reading Saul Bellow in the 1980s and Adventures of Augie March is one of the most finely crafted novels of the 21st Century. If Milan Kundera dies this year as well - that is the end of serious literature as we know it. I've read most of Saul Bellow's novels. What I like best are some of his shorter ones such as Seize the Day and Mosby's Memoirs and Other Stories. Essentially, Bellow is a novelist of ideas. 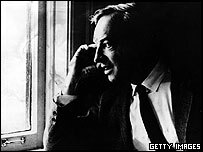 Mr Bellow's writing was a "tour de force" of creativity. A true literary genius; I admired his work immensely and will treasure his memory. I remember an interview with Bellow regarding Herzog. He said he got a lot of fan mail saying they related to Herzog and his rich but fragile inner life (as I did myself). Bellow replied to these letters something along the lines of "Herzog was meant to be pitied, not revered. He is meant to demonstrate the tragedy of living an inward life." I read my first book by Saul Bellow, Herzog, just this year. When I finished it I called all my friends and said, "You have to read this." I made a plan to meet Mr Bellow before he passed away so I could kiss his cheek. How sad to grieve an era of reading and writing departed with Mr Bellow.